This month we have three new poses! Who needs an alarm clock when you have soft touches and kisses?! It's the best Wake Up Call, when you gently prod your better half awake and add the photo to your collection of memories. Que up the music and lower the lights for this sensual pose..It Had to Be You. Capture a quiet moment spent with the one you love and finally........found. Super romantic and perfect for many scenes this one is an essential for any studio. After a long day of work or perhaps it is just a passion a glass of wine usually does the trick! This pose pack is dedicated to all of The Connoisseurs. The 5 poses include the wine glass prop. 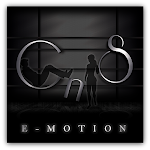 Also, Introducing the NEW CnS e-motion logo! Subscribo to get the free poses, too! P.S. CnS e-motion is participating in the Cinema event starting Oct 13th...keep a look out!